Canada and Israel have long had a close military relationship, but for some Jewish Canadians, that relationship is personal. More than 200 of them are enlisted in the Israel Defence Forces as so-called lone soldiers, serving anywhere from a few months to several years. Yonah Morrison, 20, was 15 when he first stepped off a plane in Tel Aviv. Alone in a country he'd never visited, a strange feeling washed over him: He was home. The Canadian teen spent the next two months in Israel as part of a program that familiarizes North American Jews with the Jewish state. While on that trip, he spent a week embedded with the Israeli military. 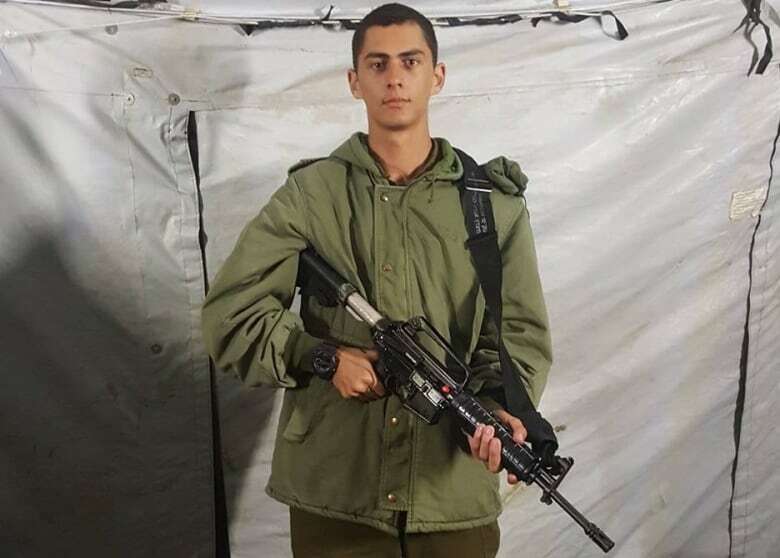 He says that week in fatigues left such an impression on him that three years later, in the summer of 2016, after he graduated from his Toronto high school, he decided to leave Canada and enlist in the Israel Defence Forces (IDF). "I always considered Israel to be my home," Morrison said. "I don't see why I shouldn't have to serve, just because I was born somewhere else." Military service is mandatory for almost all Jewish Israelis as of age 18, with notable exceptions, one of which — that for ultra-Orthodox men — was at the centre of a bitter political fight that triggered an early election call last December. But Jews from other nations are also allowed to enlist. They're known as lone soldiers. Lone soldiers are IDF members with no immediate family in Israel to provide support. Many are new immigrants and volunteers from abroad, but the classification also includes Israeli citizens without family to lean on. 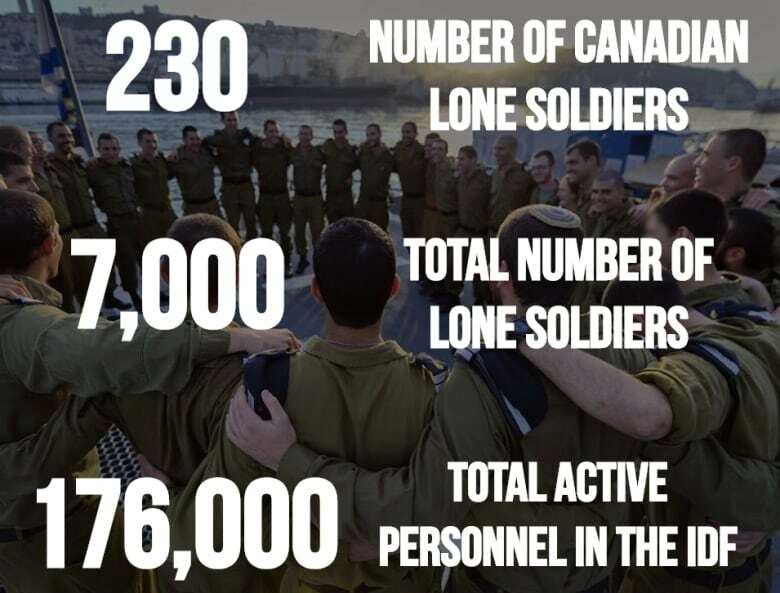 At least 230 Canadians were serving in the Israeli military, according to 2017 statistics from the IDF, with periods of service usually lasting around two years. Hundreds more go over for shorter periods of service through similar programs to the one Morrison did in 2013. 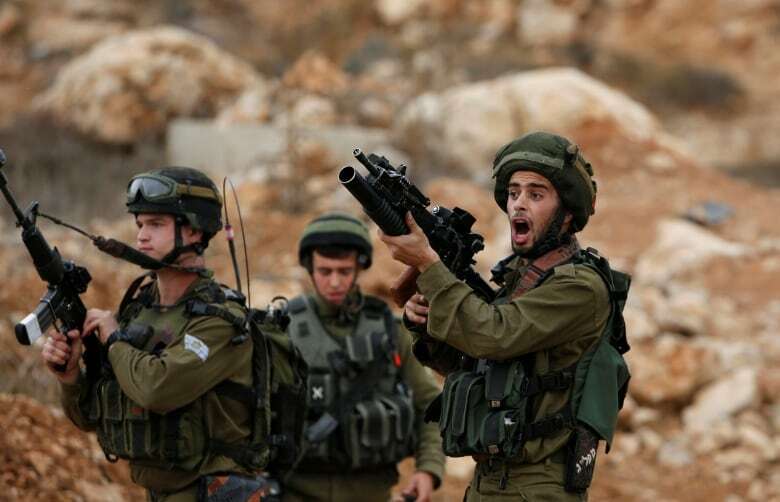 The use of Canadian lone soldiers in the IDF has attracted some criticism from pro-Palestinian activists given the military's role in the decades-old Israeli-Palestinian conflict. Clashes between the IDF and Palestinian militants intensified late last year in a two-day assault of rocket fire and retaliatory air strikes between Hamas and the military. The violence was the most intense since the 2014 Gaza war and left seven Palestinian militants and one Israeli officer dead. That flare-up came in the wake of international condemnation of Israel for its use of force earlier in 2018 at the Israel-Gaza border against protesters who were objecting to the opening of the new U.S. embassy in Jerusalem and attempted to scale a border fence. The United Nations estimates 171 Palestinians were killed and thousands more injured during demonstrations that lasted for most of the year, and another 57 were killed in "other contexts," including "Palestinian attacks, Israeli airstrikes and infiltration attempts into Israel." The UN reported one Israeli death in that period. Eran Lerman, a former member of the IDF's military intelligence division and the Israeli prime minister's National Security Council, said the IDF has protocols to handle protests without causing civilian casualties, but he said more could be done to improve the military's "social responsibility." 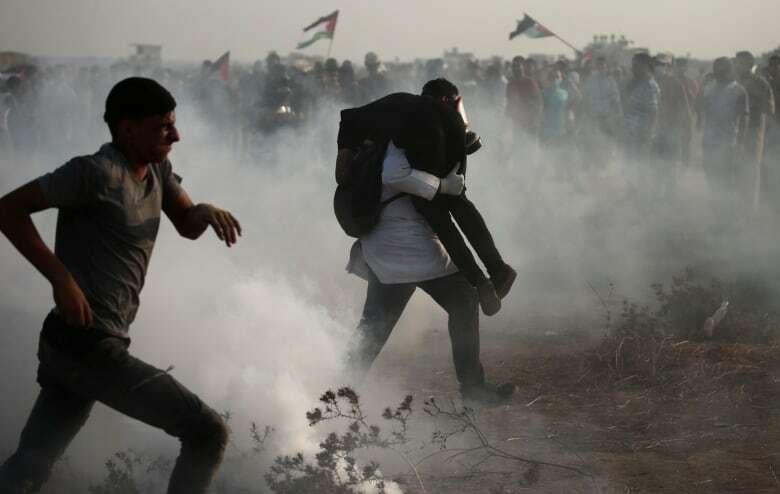 The World Health Organization and the UN voiced concerns that potentially thousands of Palestinians have been left permanently disabled as a result of injuries sustained during the protests. Doctors Without Borders released a statement characterizing the military response as "unacceptable and inhuman." Canadian Prime Minister Justin Trudeau weighed in last May, saying Canada found the "excessive" use of force "inexcusable" and called for an investigation into the Gaza shootings. Neither Global Affairs Canada nor the Department of National Defence nor Public Safety Canada currently keeps track of the Canadians serving in the Israeli military. The issue of keeping tabs on Canadians who choose to fight overseas was the subject of heated debate in the House of Commons last spring, as opposition MPs pushed back against Public Safety Canada's pitch to reintegrate returning members of ISIS. The debate resurfaced recently around the question of what to do with Canadians being held by the U.S.-backed Syrian Democratic Forces as the U.S. withdraws from Syria. But that debate concerned radicalized Canadians fighting for a terrorist group, not Canadian citizens serving in the military of a long-standing ally. Experts caution against drawing a comparison between Canadians serving in the IDF and those who leave to join extremist groups. "Israel, however controversial it might be, is considered to be an ally of the Western world," said Derek Penslar, a professor of Jewish history at Harvard University in Cambridge, Mass. "There's a very close military relationship." When it comes to military operations, Canadians in the IDF must follow the same orders as other service members, said Houchang Hassan-Yari, a Middle East expert with the Royal Military College of Canada. "When they're there, they have to perform duties assigned to them by their commanders," he said. Hassan-Yari says the Canadian government has a responsibility to take care of its citizens wherever they are in the world and as part of that should start tracking Canadians serving as lone soldiers. "It's not really acceptable for the government to say they don't keep track of that." 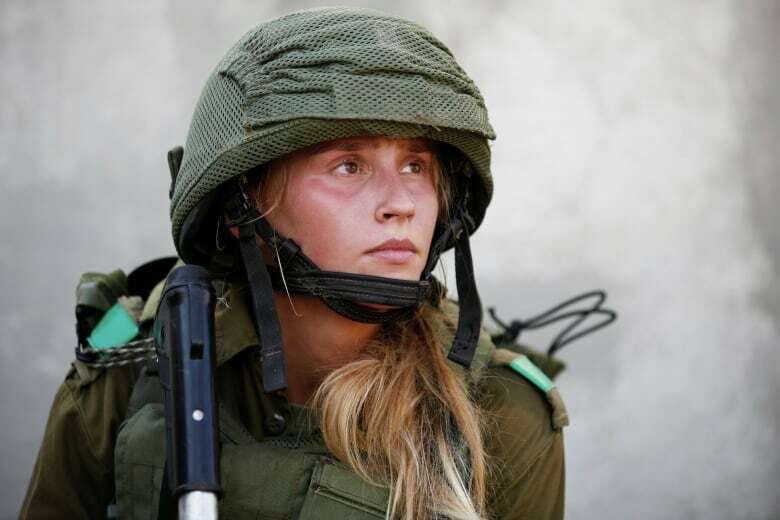 You don't need to become an Israeli citizen to join the IDF. Some programs allow foreigners with Jewish roots to serve in the force for shorter periods of time. Military rules for dual citizens differ around the world. Canada allows non-citizens to join its military, though one of the requirements is that they hold valid permanent residency and fulfil other criteria. The U.S. allows non-citizens to serve in its armed forces, with certain restrictions on the ranks and roles they can hold. Bolivia, Russia and Belgium also allow foreign nationals to serve. France has a special branch of its army made up of soldiers from other countries known as the Foreign Legion. Recruits don't swear allegiance to France but to the Legion. It has existed since 1831 and boasts almost 9,000 members from over 100 countries, according to French military statistics. Soldiers in this special unit fought key battles in the First World War and are deployed around the world. Soldiers are eligible for French citizenship after three years of service. In Canada, questions around dual citizenship and the government's responsibility for those who hold more than one citizenship have been raised in the past, and even though Israel and Canada are close allies, situations could arise that might place lone soldiers in a difficult spot. Guidy Mamann, a Toronto-based immigration lawyer, says Canadian lone soldiers could face "a conflict of interest at some point." For example, he said, they could be asked to use surveillance on Canada or be ordered to do something counter to the country's interests. If it ever comes to that, Mamann said, there are rigorous treason laws in Canada to handle those situations. Ultimately, "every country is responsible for their own citizens" whether at home or on foreign soil, he said. For his part, Morrison sees his service as protecting his heritage. "I want Israel to be here for future generations," he said. 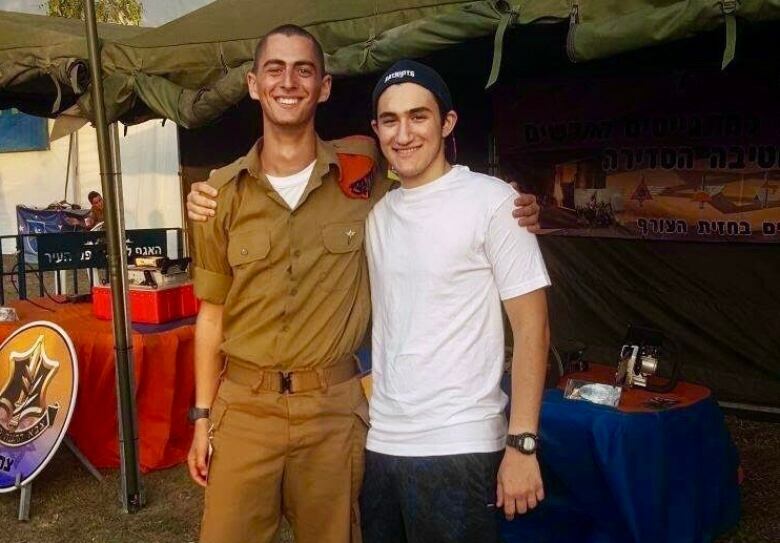 In December 2017, one of Morrison's friends from Canada joined him in the IDF. 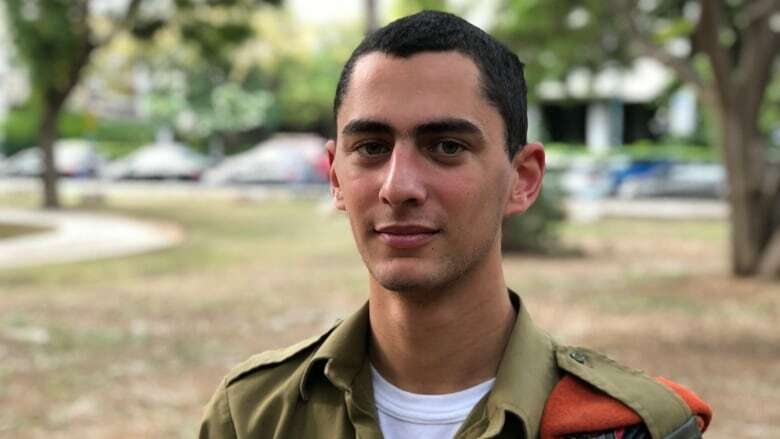 "I feel that I made the choice based on how I felt about the country and what the IDF stands for," Noam Zeldin, 19, said in an interview with CBC News conducted over Facebook Messenger. Zeldin, who is serving on a mortar team, says it's nerve-racking to have to be ready for combat at all times, even when he's asleep or in the shower but that he feels he's doing his part. "I knew Israel was a land worth protecting and a land I would want to protect." However, military life does take its toll. Neither Morrison nor Zeldin had lived away from their families before joining the IDF, and neither spoke Hebrew. Both applied for dual citizenship when they made Aliyah — a term used to describe the process of immigrating to Israel from the Jewish diaspora. "We rely on one another instead of relying on our families," Morrison said of the roughly 7,000 lone soldiers in the IDF, about half of whom are Israelis who don't have family or financial support in Israel. But that doesn't help prepare them for the danger that comes with serving in the military. Morrison said during his service, red alerts for rocket fire have been the norm. At his former military base near Be'er Sheva, a community in southern Israel, there was a bomb shelter every few metres, he said, because it only takes about 15 seconds for a rocket from Gaza to reach the base. While the IDF is a source of great pride for most Jewish Israelis, compulsory military service does have its opponents. In 2017, a teenage girl was jailed for refusing her conscription. Five years earlier, an Israeli-Canadian woman who was visiting Israel for a wedding was sentenced to three months in prison for skirting her military service. In 2016, Vice News reported that some Israelis purposefully fail tests to be declared unfit to serve. Others leave the country to avoid military service. Those who do can be arrested if they return to Israel — even for short visits — although Israeli citizens who are living outside of the country can defer military service under certain conditions. Lone soldiers' Canadian citizenship doesn't make them immune from the criticism aimed at the Israeli military. "Those who criticize Israel's choices in dealing with the Palestinians indicate that the whole of the IDF are guilty of this," said Costanza Musu, an associate professor in public and international affairs at the University of Ottawa who studies Israeli-Palestinian relations and Canada's policy in the Mideast. "By extension, any Canadian who is serving in the Israeli army ... is seen as participating in actions that are very controversial." For now, Morrison and Zeldin plan to continue serving in the IDF. Morrison is set to be released in July 2019, and Zeldin in 2020. Neither is sure what the future holds for them — including whether or not they will return to Canada. A previous version of this story stated that the United Nations estimated more than 200 Palestinians were killed during the Great March of Return demonstrations. 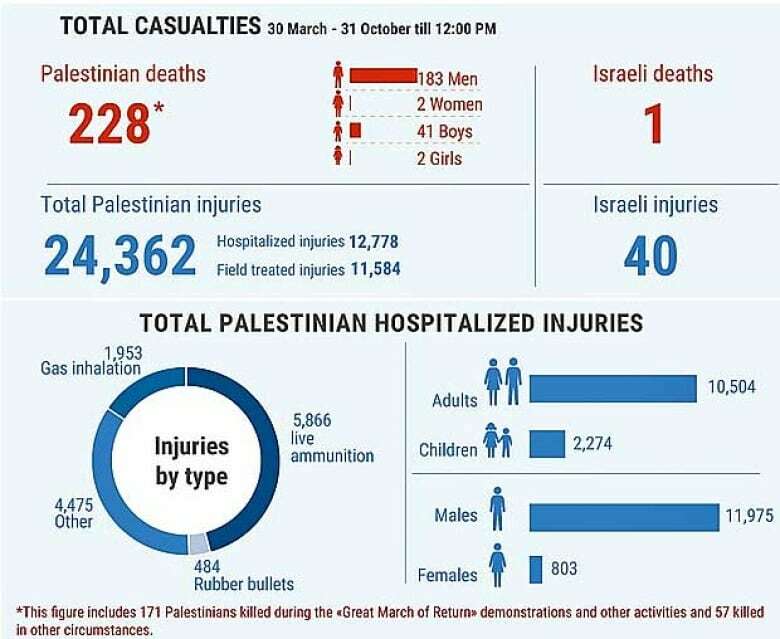 In fact, the UN estimated 171 Palestinians were killed during the demonstrations from March 30 until the end of October 2018, and a further 57 people were killed in “other contexts,” including “Palestinian attacks, Israeli airstrikes and infiltration attempts into Israel” during that period.